If you’re thinking of venturing into the art world, consider buying local. These five artists are killing it. Building an art collection takes time, patience and the knack for finding art that truly speaks to you and your personal tastes. 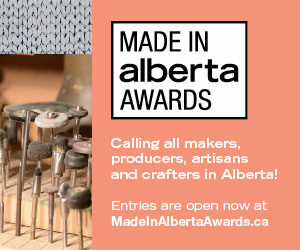 Luckily, many talented artists call Calgary (and area) home and showcase their work through a variety of venues – be it the traditional art gallery route or through local art markets like New Craft Coalition and Market Collective. Here are five local artists that are on our radar and that should find a place on your gallery wall. A mixed-media artist inspired by the magic and beauty of nature, Van Charles (aka Curtis Sorenson) is constantly creating new work that captures how utterly majestic the mountains and backcountry surroundings are. Each “painting” is built up on a hand-crafted wooden box, collaged with digital images based on Sorenson’s photographs and then detailed with acrylic paint. The results are stunning – ethereal images with striking details and whimsical touches. Beyond his personal work and commissions, he’s also worked with corporate clients in the past to create large scale pieces for office towers. Sorenson has also worked with commercial clients like UNA Pizza – you’ll want to check out his latest piece in their new wine bar concept, Frenchie behind UNA Takeaway. Katie Green is a conceptual visual artist based here in Calgary known mainly for her fine art work and mural paintings. Often collaborating with fellow visual artist, Daniel J. Kirk, Green has a recognizable style that often features elements of nature, animals or humans in layered, visually mesmerizing methods. Her work is spectacular in person – the conceptual depth and skilled accuracy of each piece is astounding to take in. Even smaller scale pieces, like the tiny original artworks done on white Converse sneakers at Gravity Pope’s Grand Opening party last fall, had Green’s incredibly detailed touch to it. Abstract painter Jill Paddock, is constantly painting. With a background in art, her studio practice really started to amp up in the last five years. Her bright and colourful abstract paintings evoke visions of oceans, blue skies and florals Her decidedly pretty palette pairs perfectly with the local Calgary businesses that she has partnered with for in-shop art installations such as Ollia Macarons & Tea and Adorn Boutique. Paddock also does commission work so reach out to her if you are looking for something in particular. You might recognize Maya Gohill‘s work from Phil & Sebastian‘s 4th Street S.W. location where two portraits of the owners sit regally at the back of the caf. The formally trained painter and illustrator is known for her Satirical Portraits (which are available for commissions), in which she captures a person’s likeness perfectly but manages to add her own quirky and original spin on the overall aesthetic of the painting. While he actually hails from St. Albert, Verne Busby‘s artwork shows up in Calgary quite often. He is currently represented by Gibson Fine Art in the Beltline. Working in a variety of mediums and formats – from public art installations to landscapes and abstracts – Busby describes his intent as “to express, in paint, the illuminating and profoundly moving chaotic forces that provide an unlimited visual pageant”. His usage of colour and brush technique make the images vibrate and pop off the canvases.